NSWG-1 Reserve Det. 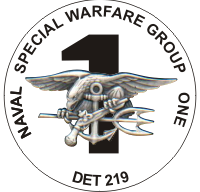 219, homeported in Port Hueneme, Calif. is a Naval Reserve combat support detachment which provides support to active duty Naval Special Warfare commands while forward deployed. U.S.